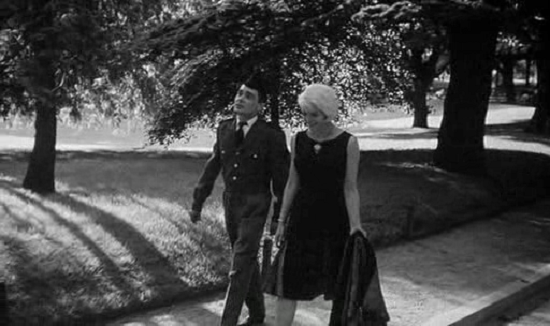 Agnes Varda, the lone woman in the French New Wave boys' club, made her reputation with her second feature Cleo from 5 to 7, a 90-minute drama set in real time rather than subjective time exploring the internal turmoil of a flighty young pop singer who awaits the results of a medical examination for cancer. Leaving behind her elegant, almost antiseptic apartment for the bustle of the Parisian streets, she weaves through crowds and watches street performers while struggling with her fears and self-recriminations, confronting her shortcomings and finding hope in a chance meeting with a young soldier. Varda captures the vibrant social world and its easy rhythms in creamy black and white with smooth long takes, bringing an almost tactile quality to Cleo's personal odyssey, punctuated with chapter titles marking the time until her appointment at the hospital. Corinne Marchand's Cleo enters as a spoiled adolescent, but introspective internal monologues and brief encounters with strangers etch a portrait of a woman hiding her fears under a façade of flightiness, only discarding the mask when she firmly embraces life in the face of possible death. 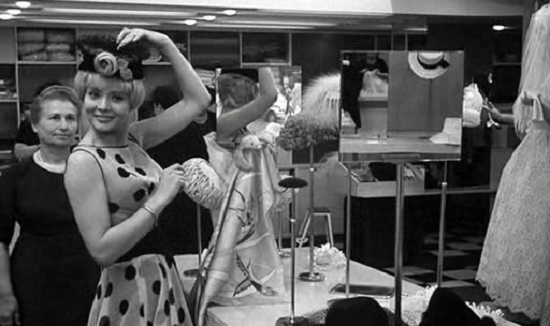 Cléo de 5 a 7 is one of the more unassuming works in the French New Wave - it has neither the historical gravity of, say, Alain Resnais's Hiroshima Mon Amour nor the shock value of Jean-Luc Godard's “À Bout de Souffle” - but in its own quiet way, it offers a meticulous record of one woman's capacity to observe, dream, and feel. One really wonders whether it was the male chauvinism that prevented the honor that Agnes Varda richly deserved as an iconic film director. Her sensitive direction is evident in masterpieces such as Vagabond, Gleaner and I. The adventures of Cleo during the two hours (real time and cinematic time) of waiting reveal the gradual peeling away of her narcissism. One can see the time on the clocks every time Cleo walks by one. An even more subtle and more telling example of how the visual images express the plot development and the transformation of the main character is in the reflections seen in windows and mirrors. During her more narcissistic moments at the beginning of the film we note that every time Cleo walks by a window we see her reflection, and she often notices it as well. As the film progresses the reflections in windows and mirrors gradually diminishes. By the end of the film there are no more windows and mirrors and Cleo is just her human self - without the added narcissistic reflections. In the last twenty minutes or so of the film Cleo has what approximates an unpretentious relationship with an ordinary fellow, a soldier on leave who is about to return to his unit to fight in Algeria. He agrees to accompany her to the hospital where she is about to get her test results. When they arrive the doctor is not there. In resignation they walk out only to encounter the doctor leaving in his car. He coldly and abruptly announces that indeed Cleo has a bad diagnosis and that treatment will be starting shortly. Cleo takes this news with surprising serenity, in keeping with the transformation from her narcissistic and hysteric personality at the beginning of the story to the more mature person she has been shown to have become. The soldier says to her that he wishes he could be there for her during the treatment. She replies that he is with her now. Cleo, during those two hours, has learned that the only thing she has is the present. The greatness of the movie is that though the subject matter is heart-rending, Varda's athletic direction prevents the film from becoming a cloying weepie. In true New Wave fashion, she incorporates any technique that suits her needs: a meandering soundtrack that picks up ancillary characters' conversations; subjective point-of-view shots; titles that separate the film into "chapters"; and documentary-style snatches of street life. Instead of cluttering the film, Varda's flourishes have a breezy, existential quality that underscores Cléo's impending news without trivializing her predicament. 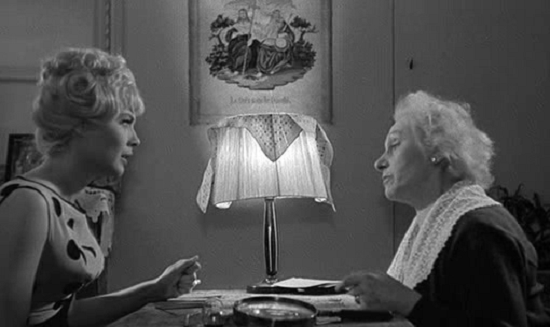 Marchand as Cléo aids the director immensely; her intuitive performance suggests a brainier Marilyn Monroe afflicted with spiritual malaise. Cléo de 5 to 7 is a beautiful work of a woman struggling between images of her public and private identity. This film is a fine example that tremendously powerful work can still be created under constrained circumstances. Cléo de 5 to 7 is a masterpiece of the human soul.